Oh my, how I loved this book! This small island town of Seashell Bay has definitely grabbed my heart! I really enjoy this authors writing style. She allows the romance to bloom and flourish throughout the story while keeping the pace of the book from dragging. While this is the second book in the series, it can easily be read standalone. After the death of her father, Morgan Merrifield is back in Seashell Bay, struggling to keep the family B&B operating and her sister safe and secure. While teaching is her true love, she can't turn her back on her sister now, but the B&B has it's problems. Major repairs and updating are needed to get visitors coming back but the money to do that just is there! Ryan Butler is back in Seashell for the summer for some much needed R&R. He's left the military which originally took him away from the island, but the private security firm he's working for keeps him busy. The real question though, how much longer does he want to live his life the way he is now. Reunited with his lifelong friend Morgan is a dream. He definitely noticed a change in their relationship after his visit last year but would a summer fling with her be the right thing??? This is an awesome read that I definitely recommend to everyone. I received a copy of this book in exchange for an honest review. Summer. The time for fun in the sun, beaches, festivals, carnivals, barbecues and of course, love. And Seashell Bay is just the place for that. Ryan Butler and Morgan Merrifield have been attracted to each other for a while but never acted on it. Now Ryan is back in Seashell Bay for the summer and Morgan makes him a proposition: his handyman skills for a room in her B&B. Ryan knows that agreeing to her proposition isn’t the best idea, but he is in need of a place to stay and he also can’t resist his attraction to Morgan. Ryan has always been an enigma to the people of Seashell Bay, even is friends and he likes it that way especially as he has no plans to settle there permanently. However, he’s willing to pitch in and help Morgan fix the inn. As Morgan and Ryan spend time together, Ryan finds himself having second thoughts about his future and Seashell Bay begins to look like a good place to plant roots. I really enjoyed SUMMER AT THE SHORE for several reasons, the first of which is the location. The serene community, the beaches, the laid-back lifestyle, the people who would pitch in to help a neighbor in need all make me want to pack up and head to Maine for the summer. Kudos to the author for creating such a wonderful place! The characters. I enjoyed Morgan because she was strong, independent and selfless, but also because she was careful and cautious in her decision-making. She gave up her job temporarily to come back and make the B&B a success for her sister’s sake and even when she wanted to give up, she held on. I also liked that she was honest and upfront about her feelings for Ryan and confident enough to tell him how she felt. Ryan really was an enigma at the beginning of the book, but as the story unfolded, you see that he’s just an everyday guy whose experiences have made him super-cautious about commitments. In spite of all that, he was so sweet for giving up his summer to play handyman for Morgan and go above and beyond to make her happy. Watching them figure out their feelings for each other and the future was fun. The story. 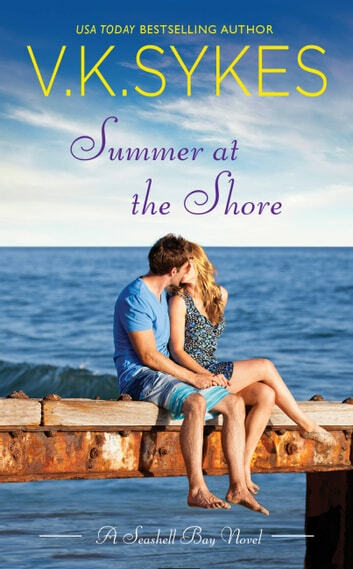 SUMMER AT THE SHORE is very well-written, realistic, with characters who deal with everyday issues and had many moments that made me smile. This is the perfect read for the summer. Source: I received this book for free from the Publisher in exchange for an honest review. This does not affect my opinion of the book or the content of my review. The authors create two very complex characters in Morgan and Ryan. Morgan is dealing with grief over the loss of her father and the aftermath of dealing with the financial situation he left behind. Ryan has reached a crossroads in his career and doesn't know what he's looking for, or even why he's look in Seashell Bay, but he finds himself on the ferry headed home anyway. The authors do a wonderful job of creating an image of Seashell Bay, and the relationship between Morgan and Ryan from the very first page, painting a picture of Ryan's perception of Seashell Bay through his descriptions of the ferry and the island and his feelings of life closing in on him. But, ever the protector and the rescuer, his initial reunion with Morgan sets the stage for their relationship during his time on the island "Hold up!" a voice cried from down the pier. "Please, guys, I really need to make this boat." Ryan recognized that feminine voice even before he saw Morgan Merrifield running full tilt boogie down the concrete platform of the ferry terminal. Her pretty face flushed and her blond hair flopping forward into her eyes, she lugged an overstuffed L.L. Bean bag in her right hand and pulled a wheeled cart with her left. Instinct made him jump up and rush down to the boat's lower deck to help her. Quote courtesy of VK Sykes and Forever Romance/Grand Central Publishing Those two paragraphs really epitomize how Morgan and Ryan relate to each other in this story. Morgan is a hot mess through a good part of the story, never able to truly get ahead of the demons and struggles that are nipping at her heels, yet Ryan is always there to lend her a hand, brainstorm an idea, and be a friend. I don't think that HE realized it was more for much of the book. Ryan knew the attraction was there - it had always been there - but I truly believe he didn't realize his feelings went deeper until he was faced with not being able to experience them anymore. A previous long-distance relationship has soured him for long-term commitment and certainly long-distance commitment, a fact that factors in to the continued dynamic of his and Morgan's relationship being temporary - she is as committed to the island as he is to leaving it. The authors character development is delightful. We get to check in with Aidan and Lily from Meet Me at the Beach and other residents of Seashell Bay, and get to know Morgan's sister Sabrina. My biggest challenge with the dynamic of the relationship between Morgan and Sabrina is that early on we were told that Sabrina was "challenged", having been diagnosed with a learning disability. But outside of what is clearly some anxiety issues, it appears more that Sabrina is immature because her family has put her in that box and she has stayed there. Many times Sabrina demonstrates her ability to make mature decisions and act accordingly. Her feelings were often "tiptoed around" when I felt that Morgan should have rather treated her like the adult that she was, giving her the respect of telling her the reality of what was going on, and what Morgan was feeling, instead of sheltering her from whatever bad news there might be. I wish there had been a bit different way in which the relationship between Morgan and Sabrina was developed but overall, the character development is wonderful and complex and the book weaves a delightful story of two people fighting their feelings that neither believes can result in a long-term relationship. The reader doesn't know until the very end whether these two will be able to find their way forward together and it made me turn the pages faster and faster to see whether Morgan and Ryan get the happily ever after they deserved. Disclosure: I received a free copy of this book in exchange for an honest review. I love a good friends to lovers story, and this hit all my requirements. Ryan and Morgan are friends who find who are fighting their attraction to each other. As the summer progresses, they grow closer and eventually give into their feelings. The story is somewhat predictable, but still very enjoyable. It's a light read with some angst toward the end that made me shed a few tears, but nothing too bad. The story mainly centers around Ryan and Morgan and their developing relationship. Morgan is really sweet and Ryan is a very hunky hero with a tender heart. I liked catching up with Aiden and Lily from the first book and am looking forward to Holly and Micah's story. 4.5 stars I received an ARC from the publisher via NetGalley for the purpose of an honest review. I was not compensated for this review, all conclusions are my own. I enjoy visiting Seashell Bay. I enjoy visiting Seashell Bay. Each story has a small town close knit community feel. 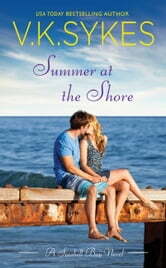 Summer at the Shore is book 2 in the series and tells Morgan and Ryan's story. Each main characters is struggling with life-altering decisions. Morgan has returned home to take care of her sister and run the family business. Ryan is at a crossroads trying to find something that gives him purpose. As they find their footing in a familiar environment they are faced with new obstacles, choices and situations. The paths taken can make the difference between happiness together or misery apart. A compelling read. Received an ARC for an honest review.